The weather got nasty at Pebble Beach during Sunday's final round. The weather at this week’s AT&T Pebble Beach Pro-Am hasn’t been great, as rain suspended play during Friday’s second round and forced over forty golfers to have to finish play on Saturday morning. 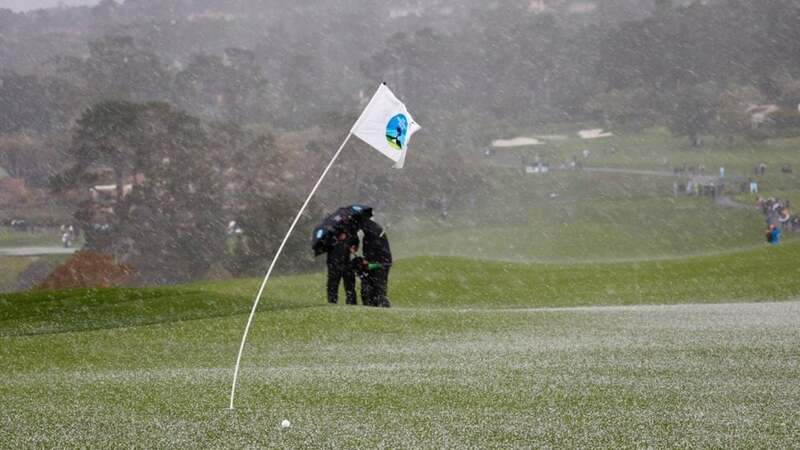 Well, the weather got a whole lot worse as a hail storm rolled through Pebble Beach and suspended play during Sunday’s final round. The start of play on Sunday had already been delayed by an hour due to rain, but that would have nothing on what was to come later in the day. Play was officially suspended at 10:53 a.m. local time as hail (literally!) took over Pebble Beach, but players were kept in position on the course. Here’s a look at the scene on the Monterey Peninsula. The greens … aren't green. You can’t even see the green, as the hail and water have completely engulfed it. Good luck trying to putt on that surface. If you’re not going to be able to play golf but have to remain in place on the course, you might as well try to have some fun like this guy did in the hail. Grounds crew hard at work to get the hail and rain off the greens. Just a beautiful day for some golf at Pebble Beach today. Play is expected to resume at the Pro-Am at 1:00 p.m. local time.